The Sunday Sun Times piece doesn't even bother to be sanctimonious on the matter of the map. Simon talks of slurs. Who has been slurred? Battered, yes. Sarah Palin has been unconscionably battered. This has been going on now for weeks. But it's no surprise. Just the latest chapter of Why they'd rather talk about Sarah Palin. Simon trots out those towering intellects, the Dems' claim over the last 50 years, even as their ivory tower ideas have failed repeatedly. Emotion and demagoguery are all they have. Adlai Stevenson and Michael Dukakis. Sigh. The Goracle, well, for someone who dropped out of both law school and divinity school, I suppose he did well by becoming a populist global warming alarmist, growing wealthy on his clearly discredited parables. The smartest thing John Kerry ever did was slur our troops and marry well. Let's see Joe the Biden is a running joke and was even then. In his debate with Palin Joe excelled himself in the number of outright fabrications that spilled out, documented here. Kind of astonishing that he felt he had to lie so spectacularly (didn't Joe know a state dinner with Iran was in the offing) when faced with someone who of course was debating on pure emotion. As for Katie Couric, anyone with any intelligence knows, including you, that Katie's real question was a dripping with contempt, "Do you even read". (Well, we know Katie has difficulty) Let me tell you a little story. I was called to serve as a juror in Cook County some years back. I got to the point where I was seated in the court room as a prospective juror. Then we were handed questionnaires. One of the questions was "What publications do you read?" So I filled it out, honestly. The Chicago Tribune, Sun Times, WSJ, NY Times, the American Spectator, National Review. Kind of balanced, wouldn't you say? Well, I was dismissed as a juror. No questions, no explanation. Clearly unfit to serve. Check out Mr. Simon's piece. He fears Gov. Palin's ability to connect "emotionally" with the voters. Never, intellectually. "The ten ways to undercut a woman candidate" must be a class in journalism school. Mr. Simon obviously aced the class. Perhaps so. Not long ago I was on a new media panel in the People's Republic of Evanston. We're about midway through and we were getting to the meat of MSM media bias:) I had more than a few concrete examples. So what was the counterpoint? The Dean of Northwestern's Journalism School called me "rabid". Is that what they're teaching at Medill these days? I'm not running for office but you get the idea. Why do they hate her? Why do they hate us. I disagree with his conclusion that Gov. Palin can't take the pressure. I believe she will do a great job when its HER platform that she is defending. Yes. She's hasn't had the opportunity to run on her own platform. Yet. The leftist appeal is all emotion. The elites condescend with it and use it as a tool of control. They are smarter than we are, you see. To be precise, they personally think they're smarter than the other lesser lefties as well. They have targeted her from day one. Viral attacks are where it's at in 2008. Emails, blogs, online news sources. Content flows upstream in today's media environment. We can be the gun. Indeed, if Barack can't or won't do the dirty work, then we have to do it for him. No excuses. No more hand-wringing. Sarah Palin is a threat, yes, because she connects with Americans. She's not just the words the Dems spin, fighting for the little guy--she is the little guy. She's all substance. Sarah Palin rose on her own merits, she took on the entrenched elites in her own party and won. Now she's poised to do the same with the rest of the country. She's worked hard all her life and she knows what works. She knows America by heart. 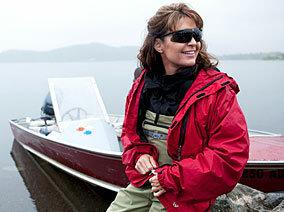 Taking on the dysfunctional elites, Sarah Palin. Let's roll. “I wanted to ask all the gurus here why so many of the Tea Partiers are women,” she said. “I find that just intriguing and don’t quite understand why that has happened.” Indeed. For Stahl and her ilk, real women care about day care, not deficits. Policy aside, the arrivistes were incomprehensible to liberals for cultural reasons. The old guard, consisting mostly of lawyers, writers, journalists, and other media types, tended to cluster on the coasts. The new crowd came from the South, the Midwest, and the West, and a number of them were businesswomen—not surprisingly, given that women are now majority or equal owners in nearly half of American businesses. Some were techies, such as Tea Party organizers Jenny Beth Martin of Georgia, a computer programmer, and Michelle Moore of Missouri, who ran a technology consulting firm. Nikki Haley, South Carolina’s newly elected governor, was an accountant in her previous life. The new congresswoman from South Dakota, Kristi Noem, runs the cattle ranch that she inherited from her family. Tech geeks, businesswomen, and ranchers: not Lesley Stahl feminism, that’s for sure. Further unsettling the feminist framework was the vigorous maternalism of the newcomers. I do think her cheerful perseverance and courageous insight has inspired more moderate to conservative women to run for office this year. It is no coincidence that the majority of TEA party leaders are women. These women care about the issues everyone else does--they're not running on "women's issues" as defined by the illiberal left. And as we look to the future we want an America that doesn't crush the spirit of the children we bore for a better day. And other lovely leftie news:"[T]hink a play about a bunch of conservatives getting together each week to kill a lefty (and then maybe having second thoughts) would get such a favorable review?" Althouse. In other words, while Gosnell was collecting jars of tiny feet, severed from the babies he ended the lives of, abortion practitioners from coast to coast were performing the eerily similar procedures. And 100% of them done with the backing of the National Organization for Women, the National Abortion Rights Action League, and a long list of U.S. Senators, including then Senator Barack Obama. It was State Senator Obama just a few years previous who had also called for votes on three occasions, in a committee that he chaired, in meetings that he had called, in which the life of a born child was in equal jeopardy to the ones Gosnell delivered. The issue was a debate over whether or not Christ Hospital in Oak Lawn, Illinois (a hospital operated by the denomination of Obama's church) could continue a practice in which a woman's labor could be induced weeks ahead of delivery. Roughly 75% of the children would die in the process, leaving roughly 25% who survived. The dysfunctional elites. See no evil. ...No, no, no. We the people are the eeeeevil ones. More. Thanks for the link, Rose. Well said! And, linked. Thanks.